Adorning a floral saree paired with a golden sequins blouse, Diipa clearly knows how to take Sabyasachi a notch higher! Her minimal makeup look was crafted by M.A.C.’ UK team and Nisha Sirpal. Oleg looked dapper in a off white kurta with a shawl draped over his shoulder. For the haldi Diipa chose a custom made golden lehenga by Ritu Kumar. The intricate design added to the function’s grandeur. The hairdresser, Aamir Naveed strew a couple of gajras in her hair and paired a maang-tikka with it, giving it a hatke look. She even wore gajras in her hands. Oleg was definitely not ready for the haldi that was smeared all over him! Diipa and Olegs’s sangeet pictures will make you want to get up and shake a leg on some bollywood tunes! Diipa wore a custom made Anamika Khanna couture. The twist in her outfit was the two way skirt under which she wore pencil pants. Oleg opted for Varun Bahl sherwani for the sangeet night. 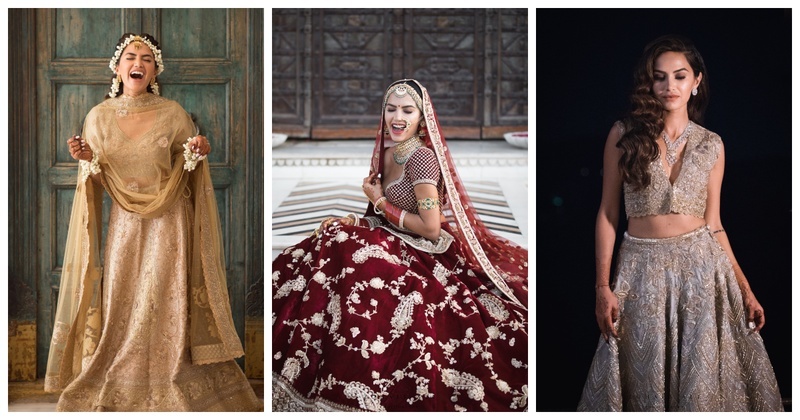 I had a total fangirl moment when we saw Diipa’s maroon Sabyasachi lehenga. Resplendent doesn’t even cover it! Oleg’s white floral sherwani complimented her maroon lehenga perfectly. Checkout their emotional rollercoaster of a wedding! Ditching the old school route, Diipa wore not one, but two outfits at her reception! I vote for the bottle green blouse with golden lehenga. Don’t worry, Oleg stuck to a dark coloured sherwani throughout the function. This dreamy wedding wouldn’t have come together without an army of dedicated professionals who made sure that Diipa got everything she wished for. I am sure you can draw some inspiration from this elegant wedding!